This reminds me of all the great Marvel #1's of days gone by. Back when fresh concepts still debuted in #1 issues. Days when a masked face leaping at the viewer was worth flipping out a few bucks to explore, and I'm guessing from this cover, at Archie Comics it still is. 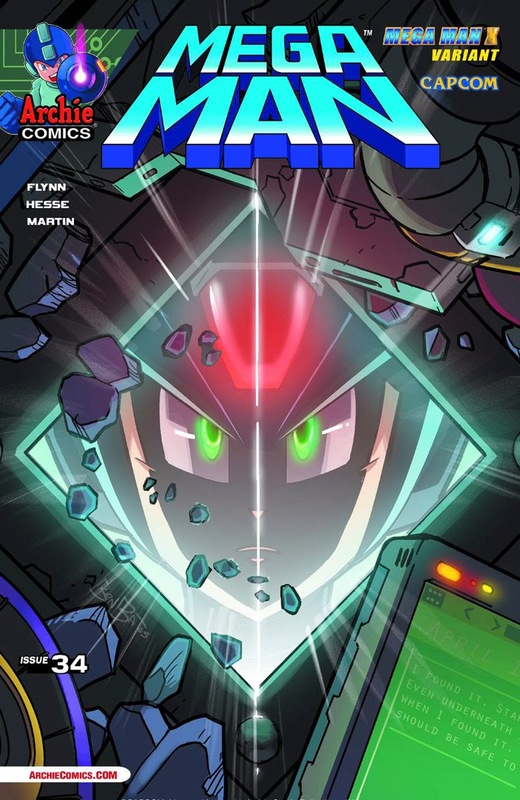 The debut of Mega Man X! 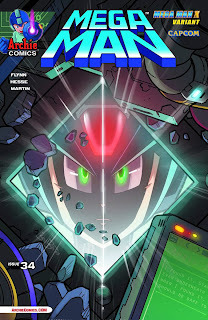 But first, in Shadow of the Moon Part One: Mega Man joins a research team seeking the truth behind Dr. Wily and Ra Moon. Then, in The X Factor Part One: 100 years in the future, Dr. Cain discovers Dr. Light's final, greatest creation -- Mega Man X! The road to the next big mega-crossover starts here! What do you think? 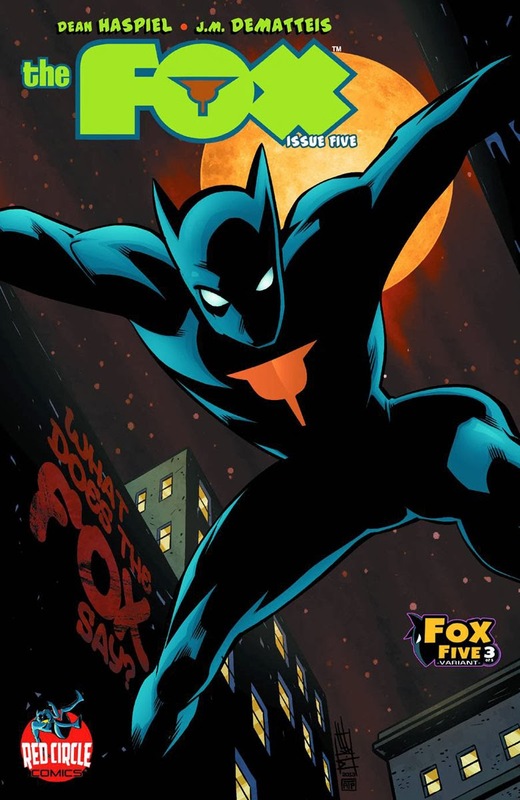 For Archie Comics' other comic solicitations for February 2014, click through to the next page! The Archies' Rocking World Tour part 4. The Archies, Bingos, Pussycats, and Madhouse Glads' tour concludes in the great white north, Canada! The bands enjoy the end of their time together as they trek across the country from Montreal, Toronto, Calgary and Vancouver. What will happen to the bands once the tour is over? Will the Bingos and the Glads use their newfound fame from the Archies tour, or will they go the smaller, indie route? What will become of Archie's relationship with Valerie? And his relationship with Amisha? And, of course, his relationship with Betty and Veronica? There's still a few surprises left as Archie and the gang return to school. Riverdale High, watch out! 32 pages, $2.99. There's something strange about Archie's Uncle Albert! What is it about him that's bugging both Archie and his dad? Why is there a kettle on to boil, and does it look like rain? Could it could be that he's a little bit crooked? See what we mean in the wacky lead story to this fun-filled double digest! 160 pages, $3.99. Meet Ultra-Teen: Chuck's new superhero creation. He's super fast, super strong, and he's got x-ray vision! He only uses his powers for good -- but can too much good be a bad thing? Find out if Ultra-Teen's goody two shoes behavior can save the day -- and save his friendships -- in this super lead story! 160 pages, $3.99. (W) Michael Uslan (A and C) Dan Parent, Bob Smith. Betty or Veronica? What makes someone a "Betty" or a "Veronica"? The two BFFs search for that answer themselves in this fun new arc by comics great Michael Uslan! When the girls are absolutely bored with their normal teenage lives in Riverdale, they're offered the opportunity of a lifetime: a chance to study abroad in five different countries in a year! There's only one caveat: only one of the girls can go! It's going to take some competition-and some soul searching-to pick the winner! See who steals the spotlight, and find out if you're a "Betty" or a "Veronica" in this fun story! 32 pages, $2.99. Betty and Veronica are always in competition with one another -- but that gets kicked into high gear when the two enter the Miss Riverdale Teen Contest! But there's another contestant that really steams things up. Enter: Cheryl Blossom! May the best woman win! 160 pages, $3.99. It's time for the student-faculty bowling night! It's teachers vs. students and, while the teachers may be older and have plenty of years of bowling experience on their side, some changes to the game might lean in the kids' favor! 160 pages, $3.99. (W and A) various (C) Rafa Knight. It's a special super-sized edition of the Sonic Super digest! Sonic the Hedgehog's adventures are now available in the popular digest format, but that's just not enough Sonic for all you hungry Sonic fans out there! By popular demand, get ready for a super-sized issue filled with even more Sonic the Hedgehog goodness, stretching back to the beginning of the comics' 20 year history! Can Sonic and the heroic Freedom Fighters save the world from the evils of Dr. Robtnik? Discover all the thrills, chills and spills for yourself with classic Sonic comics as only Sonic Super Digest can provide! 224 pages, $6.99. The Shattered World Crisis continues! "The Chase" Part One: Uncle Chuck and Professor Pickle -- captured by the nefarious Dr. Eggman! It's up to Sonic and the Freedom Fighters to secure the precious kidnapped cargo from the Egg Train! But they're going to be in for the surprise of their lives when they discover that there are more than just badniks guarding it -- can Sonic handle the deadly, mysterious E-107 Theta? 32 pages, $2.99. (W) Ian Flynn (A) Jim Amash and various (C) Tracy Yardley and various. Shadow Fall Part Three: Shadow -- agent of the brutal Black Arms? It's up to Rouge and Omega to bring their former friend to his senses -- if he doesn't destroy them all first! Meanwhile, the vicious alien race have stolen G.U.N. 's tactical nuclear device for -- and that can only spell trouble! Will Team Dark survive the mission with the deadly and devious ECLIPSE lurking in the shadows? Find out in the penultimate chapter to this expansive space epic. 32 pages, $2.99.